Welcome. The your Home Matters program provides information to help you manage your home equity account and make the most of your relationship with Wells Fargo. Visit anytime you have a question about your account. We can help you make your payment online, view your account balance and history, and much more. Your Wells Fargo home equity account is a powerful tool that can help you achieve your financial goals. Enjoy competitive rates that are typically lower than many other forms of credit, flexible payment options, and tax deductible interest if your home equity financing is used to improve, buy, or build a home (talk to a tax advisor for details). To learn about the features and benefits of your home equity account, review the questions and answers under the Home Equity Lines of Credit section, below. Take a tour of a sample home equity line of credit statement and learn what information you'll find in each section. How can I manage my account online? If you have a home equity line of credit, you can manage your accounts online, almost anytime at Wells Fargo Online®. Wells Fargo Online® allows you to view account activity and statements, make payments, transfer funds, pay your bills and much more. Enrolled but don’t see your account? Add your account for online access. How can I use my Home Equity Line of Credit? Your line of credit gives you convenient access to available funds at an interest rate that's typically lower than many other forms of credit. You'll receive monthly statements in the mail. And you can view your account online with Wells Fargo Online®. You can set up recurring payments so that you don't forget to make a payment, or switch to paperless statements to help prevent fraud. Access credit when you need it. Your revolving line of credit allows you to access your available credit as you pay down your principal balance. Transfer funds to your other Wells Fargo accounts with Wells Fargo Online®. Request an Enhanced Access® Visa® credit card to access your funds or activate your current card now. Link your line of credit to your Wells Fargo ATM Card so you can make transfers and payments from any Wells Fargo ATM. Request or reorder Home Equity Access Checks. Use Bill Pay to pay your bills directly from your home equity line of credit. Home Improvements. Use your home equity line of credit to finance home improvements that may boost your home’s value and make your home more enjoyable. Large purchases or unexpected expenses. Finance important purchases, or be prepared for unexpected expenses — such as car repairs. Your Home Equity financing may provide tax advantages if it’s used to improve, buy, or build a home. Talk to a tax advisor for details. Check out our quick guide to accessing your home equity line of credit online. 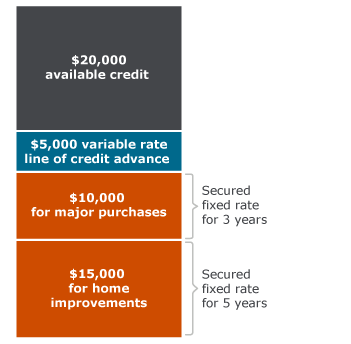 What are the benefits of a fixed-rate advance option? If you’d like a fixed-interest rate, a fixed-rate advance option may be the right choice for you. It’s an easy way to manage your monthly payment and protect yourself as interest rates rise. Many Wells Fargo home equity lines of credit already have this feature as part of the account. The fixed-rate advance option gives you the flexibility to secure a fixed-interest rate on any or all of your outstanding line balances during the draw period so your payments remain the same month after month. Choose the amount of your outstanding variable-rate line of credit balance that you want to move to a fixed-rate option. Change your fixed-rate advance back to a variable-interest rate at any point during your draw period. The transferred funds will be charged the variable-interest rate that’s in effect at the time of your transfer. Plan for your future monthly payments with a fixed-interest rate on specified balance(s). Choose the term of your fixed-rate option. Your home equity line of credit gives you the flexibility to configure your balance in the way that best meets your needs. Call 1-866-834-9761 to review your needs with a Wells Fargo Home Equity Specialist. How can I request a line of credit increase? We look at the fair market value of your home, minus the total amount of debt you may owe. This debt includes your mortgage, existing line of credit, and any other home-secured obligations. A good credit rating and a history of responsible money management are important. The better your credit rating, the more likely you are to qualify. To apply for a line of credit increase, call 1-866-834-9761 or apply online. How can I pay down or pay off my account? Retain quick access to available credit for unexpected expenses or major purchases. Spare yourself the need to reapply and be approved again in the future. Keep your account’s current interest rate. Of course, you may arrange to pay off and close your entire line of credit at any time. (A prepayment fee may apply if the account is closed within three years from account opening.) Please call us at 1-866-404-3149 to discuss your options. Depending on the current interest rates, homeowners may choose to refinance their first mortgages. Typically, the bank refinancing your first mortgage will pay off and close your home equity line of credit account. However, you may be eligible to refinance and keep your Wells Fargo home equity account open — allowing you to keep your current home equity line of credit account interest rate, terms, and access to funds — through a process called subordination. Learn more about subordination and see if it may be right for you. How do I order checks for my home equity line of credit? You can call us at 1-800-667-5852 to have checks mailed to you. How do I make a wire transfer to my home equity line of credit? You can use a wire transfer to make a regular payment or an additional principal payment on your line of credit; you can also pay your line down to zero or pay it off so that it can be closed. Before paying off your line of credit, please call our Customer Care team at 1-866-275-9138. How many years will I have to access my available credit? Most home equity lines of credit have 10- or 15-year draw periods from the date that your line of credit was opened. What monthly payment options are available? Principal plus interest. Each month, you make principal and interest payments on your account. Principal only. In addition to regular principal and interest payments, you can choose to make additional principal payments to reduce your balance faster. You can do this without penalty so long as you don't close your account. Our home equity specialists are here to help you understand your payment options so you can find the right one for you. Please call 1-800-667-5852 to learn more. What does end of draw mean, and what happens? For a home equity line of credit, end of draw is the point at which the draw period ends and you can no longer access funds. Most lines of credit have a 10- or 15-year draw period and then move into the repayment period, when you’ll repay your outstanding balance with principal-and-interest payments (also known as fully amortized monthly payments). Depending on your contract terms, the interest rate may change from a variable rate during the draw period to a fixed rate during the repayment period. The combination of the fully amortized monthly principal-and-interest payments and the fixed interest rate may increase your monthly payments substantially, especially if you made interest-only payments during the draw period. Some home equity lines of credit include a balloon payment, which requires you to pay the outstanding balance in one lump sum at the end of the draw period. Learn more about planning for the next phase of your home equity financing. How far in advance should I prepare for end of draw? It's a good idea to plan for end of draw when you first open your home equity line of credit. Making principal-and-interest payments from the beginning will help you when your line of credit enters the repayment period or when you have to make a balloon payment. We recommend that you pay particular attention at least two years before your financing reaches end of draw. If you're having financial difficulties, you may be eligible for a home equity assistance program. The Enhanced Access® Visa® credit card is not available in Connecticut, New York or Texas. ATM access is limited to transfer of funds only in Connecticut and New York. ATM access is not available in Texas. Other restrictions may apply. Home equity access checks are not available in Texas. You may not use these checks to pay a balance on any account you have with Wells Fargo. There is no monthly service fee for Bill Pay. Charges may apply for the Wells Fargo Same Day Payments ServiceSM. Please refer to the Online Access Agreement for fees associated with our online services. Account fees (e.g. monthly service, overdraft) may apply to the funding account. For more information on the account fees, please refer to the account agreement you received when you opened your account. Line of credit increases are not available in Texas, New York or Nevada. Refer to your credit line agreement for additional information regarding product terms and features.